We were very excited to have the opportunity to review NaturePaint we choose the lovely colour Camellia as we love neutral tones..
NaturePaint is made in Cornwall from both locally sourced ingredients like chalks and china clays, to exotic pigments including French ochres and Italian sienna.. this gives a Rich natural intensity..and a strong depth of colour...i love the fact that NaturePaint is non toxic...this is great as i have a son and a couple of house bunnies..there is nothing worse than having the smell of lingering paint. 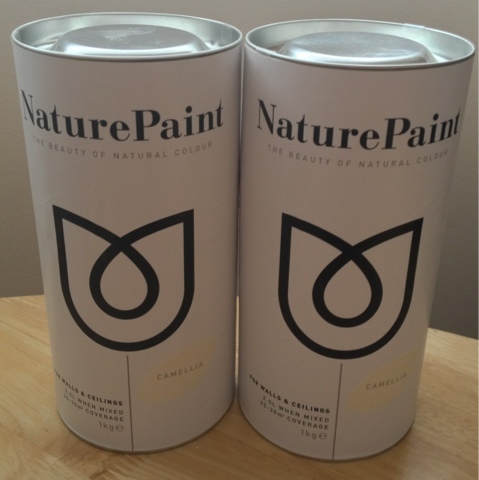 As soon as the paint arrived we couldn't wait to get started, it comes in a dry powder form, presented in recyclable packaging, allowing it to be disposed of easily and in an eco-friendly manner. I simply emptied the powder into a mixing bowl then added the recommended amount of warm water and stirred, i left the mixture to thicken for about 20 minutes..then i gave it another good mix and poured it into a paint tray..i applied the paint onto the walls using a roller, the paint went on really easily..and gave an excellent coverage..it was so easy to clean the roller and brushes after...this would normally take ages. My sitting room looks so much brighter and fresher..and to be able to use the room straight away was an added bonus..my hall way needs to be freshened up next, i will be purchasing NaturePaint to do the job. They have such a lovely selection of colours, for more information please visit NaturePaint also available online at JohnLewis & B&Q. Disclosure : i was given NaturePaint to review, all comments and opinions are my own. This looks wonderful. We are currently decorating our new home so I will definitely take a look at their paints! I like the sound of that. Good for the environment and no nasty paint smells.